Both the Sun and Mercury are happily ensconced in Virgo now – going over details and removing the ‘wheat from the chaff. Sun conjuncts Mercury on 21st Sept. A great day to discuss details and sign contracts. Venus also sextiles Saturn while, Saturn trines Uranus 13-15th September. Jupiter is still in Scorpio churning up hidden things, most notably how we feel about ourselves, our relationship to money, our value etc. A light has been shone on all these areas. Now, we have Venus in shadow following the breadcrumbs left by Jupiter – about to go retrograde in the same sign, Scorpio. Focusing that light now on: relationships, how we value ourselves and our relationship to money. One way or another we’ll all be dealing with relationship issues. New, unexpected, out of the blue new romances may start especially around the times Venus is opposite Uranus (see dates below). Venus in Scorpio at 2 degrees opposite Uranus retrograde at 2 degrees in Taurus 12/13th September marking the first of three oppositions due to both planets eventually being retrograde. 2) The second will be on 31st October when Venus, now retrograde will be at zero degrees of Scorpio and Uranus at zero degrees of Taurus. Happy Halloween anyone?! 3) The third will be 30th November; Venus will be direct at 29 degrees Libra and Uranus retrograde at 29 degrees Aries (its final return to Aries before going full force into Taurus early January 2019). Venus squares the North Nodes in Leo and South Nodes in Aquarius (which already has Mars hovering close by adding heat) on 16/17th September. Mars conjuncts the South Nodes and opposes the North Nodes (where we need to go) in Leo. We need to put energy into creativity and love collectively. And…the day after Venus retrograde goes direct, Mercury in Sagittarius goes retrograde (it goes direct on 6th December @ 27 degrees Scorpio- Whoa)! The sign of Scorpio is getting a workout, bringing up all the dark stuff but look how beautiful a diamond can look once released from the earth and all polished up). This whole Venus retrograde period is predicated by honesty, truthfulness and asking what truly feels real to you. Where love doesn’t exist or is withheld we must work out a solution, so it fits with who and what you have become now. Values, especially value of self (and whether others are valuing you) will be a big area of review. Money will always be tied in to this. Using the Power of Attraction concept of the more we value ourselves the more money or valuables come in for us. So, ask: Is this person, thing, place valuing you? Do you value it? Meditation and therapy would be an awesome way to use all this energy Sept/Oct/Nov and finally the picture stars taking real shape in December. It will be a process. Although you will be immersed in this try pulling away at times and look at things from the tree tops. Write things down to be reviewed later. Change your mind as you work your way through the deep labyrinth of you. All I can say (to add some humor) is, in the immortal words of Ron Burgundy (from Anchor Man): Keep it classy San Diego!! The Fall Equinox occurs on 23rd September just before the Full Moon in Aries. The changing of the seasons, in the Northern Hemisphere, Fall. Where the energy of nature starts withdrawing inwards but, the warmth of the sun still graces our face. Mars in Aquarius conjunct South Nodes of Moon (where we are to let go of things, people, places) 26-28th September and, of course, opposite the North Nodes of the Moon in Leo (where we should be developing ourselves). We may have impulses to throw things out, people, things, etc. It is a good time to do this for sure. Just do a quick scan before you toss! The Nodes in Leo and Aquarius will change up in November and be replaced by the Nodes going into Cancer and Capricorn- this is a security/safety axis for the next 1.5 years (I’ll talk more about this in November). 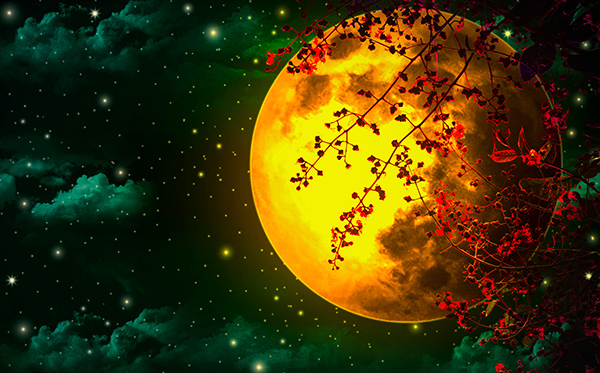 Full Moon in Aries at 1-degree Aries 60 minutes on 24th September 2018 at 7:52 pm Pacific Daylight Time and conjuncts the healer, Chiron. Being a Full Moon, the Sun is opposite the Moon in Libra, and it squares Saturn in Capricorn. Learning lessons on being free from a situation that needs healing especially as it relates to expressing our originality and blazing our own path of truth, without apology. Mercury conjuncts the Libra Sun and opposes the Aries Moon. Mars rules this Full Moon in Aries and it is conjunct the South Nodes of the Moon. Message: Have the courage to let go of the past and aim your arrow to the future (Chiron, the Centaur, conjuncts this moon) to the North Nodes of Moon in Leo and creatively and with love be your authentic self. Have the courage to be you! Pluto goes direct on 30th September @ 18 degrees Capricorn- you got the Power!! Where you have not had the power to make needed changes in the structures around your life; now it is a green light! Go! Jupiter forms a sextile (in orb) to this newly direct Pluto in Capricorn. Lots of opportunities to create those structures that support a powerful new you! A salute given to a powerful leader from the people! The ability to look at oneself in the mirror and see humor in it. In my mind it also, by extension, brings up the Buddhist ‘polishing the mirror, to reveal a more beautiful surface underneath’. This is very much what the whole Venus in shadow, Venus Retrograde period is suggesting. The Full Moon conjunct Chiron says healing can come from not being afraid of being who we are, looking in that mirror and smiling.